Y’all know we bought our very first bees last year & it’s been a blast raising these girls. But there’s typically no honey harvest that first year as they’re getting established. The honey they make during that first year needs to remain with the hive to see them through the winter. 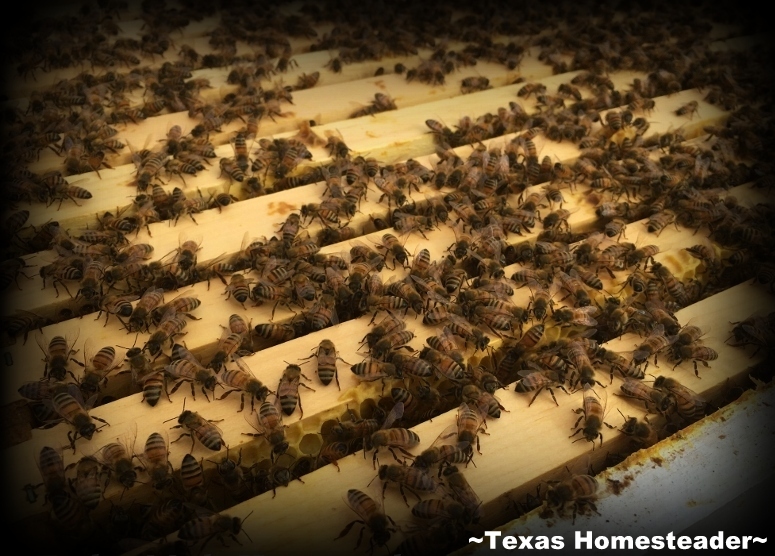 We overwintered our bees and they came through this spring with flying colors! So we split the hives about 8 weeks ago. Bibbidy-bobbedy-boo our 2 hives turned into 4! After the split we allowed the hives to recover a bit before we inspected them again. The hives without a queen raised a new queen to take her place, the hives that retained their queen kept on with business as usual. Our inspection today showed that now we’re ready to add a honey super to the two stronger hives. A little background: Each of our hives consist of two deep hive boxes. When the bees have built out about 90% of the top deep box frames with brood, comb & honey we know it’s time to give them what’s called a honey super box. It’s simply a box where they’ll begin storing honey. The queen will continue to lay eggs in the bottom two deep boxes but we’ve never had her go all the way into the honey super. Some beekeepers like to add a queen excluder which has holes too small for the queen to fit through. This will assure that she stays out of the honey super. Then the bees will begin making the honey in the honey super box that we’ll harvest around the first of July. Now when these honey boxes are full of honey they’re mighty heavy! Although the boxes are all interchangeable in circumference, they vary in depth – shallow, medium & deep. To keep things manageable RancherMan & I decided to only use medium boxes for our honey supers. See the picture below? The yellow frame is how deep a medium honey super is. Compare that to the depth of the black deep hive box frames. Now don’t get me wrong, they’re still heavy when they’re full of honey. But a medium box filled with honey is only about 60 lbs as opposed to a whopping 100 lbs for a full deep hive box. So RancherMan decided today was the day to add the honey super to those two hives. It was a very quick procedure. He gave the bees a little smoke to calm them, and removed the lid to one of the hives. 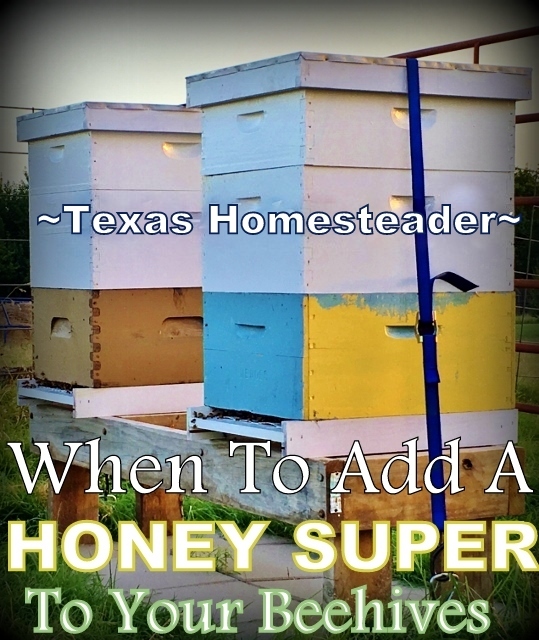 He placed the medium honey super box on top of the hive and replaced the lid. He did the same to the second hive and then strapped them both back down. That strap will assure that even if a storm blows through our hives’ lids won’t blow off. Now it’s time for the bees to get busy building that comb in those honey supers and filling it with that sweet honey we crave! 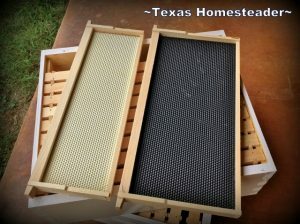 This entry was posted in Blog Posts and tagged Beekeeping, Spring on May 26, 2017 by Texas Homesteader. I love following your beekeeping adventure- so fascinating!